Promote your Motorsports and Moto GP teams with one of our Motorsports marketing flight cases. We have various aesthetic options available upon request to promote your Motorsports team/brand, including screen printing, coloured materials, total vinyl wrapping and coloured extrusions/furniture. 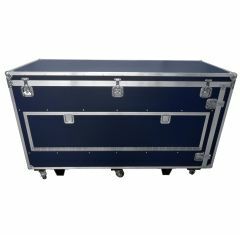 Our Motorsports marketing flight cases are designed to promote your team and brand whilst still protecting and storing your items. Custom CNC routed foam fittings are available to protect and present your Motorsports items.